Description: UADE MUI Frontend for MorphOS by MarX. which loves old Amiga music modules :). But what is UADE ? 200 music file formats from Amiga computer (e.g: MOD, MED, AHX, Future composer). desk. Beside my keyboard and Mac Mini (MorphOS running on it ;) I saw a CD box. It was Depeche Mode album called EXCITER. Hallelujah!!! - Run Exciter Player and go to menu Settings->UADE Prefs. Choose exec. 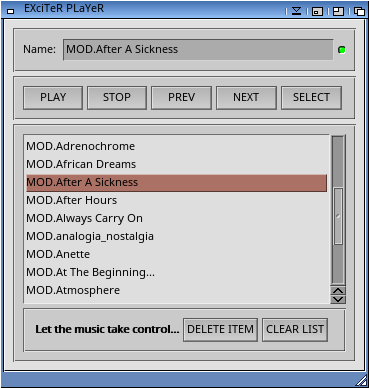 file with UADE player and save configuration. 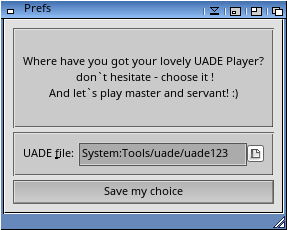 but the main goal has been reached - GUI for UADE is alive and working! But what should be done in the near future? - Make a separate version for AmigaOS4 users. - UADE is based on UAE so the copyright is GNU GPL License. is my little tribute to the modern and classic Amiga's countenance. Let`s save this great music and great memories ! I want to send greetings to all my "Amiga friends" from Poland. Also many thanks to Rzookol, Stefkos, Kiero and Krashan for their invaluable help! Thanks to Piru and SHD for great UADE!